Political officials campaigning in Chinatown for the midterm election through glass windows facing the Chinatown main street. Their names in English and Chinese are exposed to thousands of residents here. Photo by Yiyan Zheng/ BU News Service. BOSTON — Thirteen Cantonese-speaking Charlestown residents sat at a Halloween decorating long table on the evening of Oct. 29, listening to a voter education workshop organized by Chinese Progressive Association (CPA) in their community center. Baolian Kuang, Community Organizer of CPA, enticed these seniors by first feeding them the news of MBTA’s possible fare raise in 2019 and the coming public hearing. “Compared to voting rights, they are more concerned about the basic necessities of their life.” Kuang explained. At the same time, Eco Lin, a Quincy resident, was busy serving customers at Gourmet China House in the heart of Boston’s Chinatown. 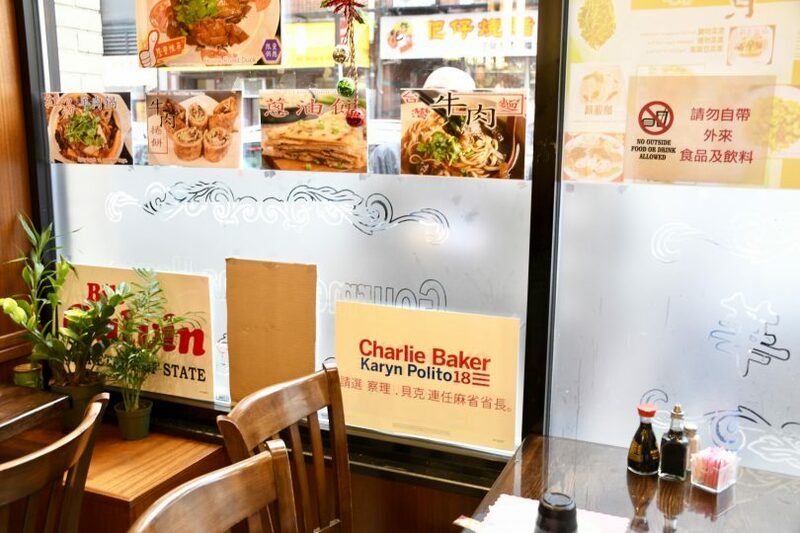 Charlie Baker’s campaign banners, in both English and Chinese, are posted on the glass window, juxtaposing pictures of beef noodles and scallion pancakes. “You will know once you have kids. State and presidential elections do not matter as much,” Lin said. He showed limited enthusiasm towards the midterm election. A bilingual ballot sample was shown on the big screen during the workshop when residents in Charlestown moved on from the bus policy to the voting education. Thanks to the Voting Rights Act enacted in 1965 and its 1992 amendments, when more than 5 percent of voting age residents speak a minority language, election materials must also be available in that language. Boston started to provide paper ballots in English, Mandarin and Vietnamese in 2006 but it wasn’t until 2014 that former Gov. Deval L. Partick signed legislation into law, rendering it more empowering and valid. The act rules bilingual ballots in English and Chinese or Vietnamese shall be provided in each polling space where more than 5 percent of voting age citizens in the precinct are members of that language minority. 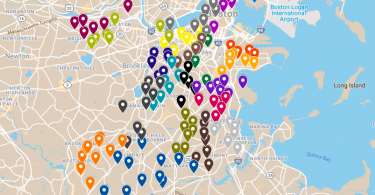 In other words, bilingual ballots are found available in the precincts with high concentrations of one racial minority live, such as in Charlestown and in Chinatown, but not in the whole city. According to the 2018-2019 Secretary of the Commonwealth Ballot Contract, the city requires only official ballots in Chinese and Vietnamese. Absentee ballots and early vote ballots are still not bilingual and even though there was an Early Vote Day held at Wang YMCA of Chinatown on Oct.30, the early vote paper ballots were not offered in Chinese. As for Quincy and Malden, two cities with the largest Chinese population in Massachusetts outside of Boston, materials are not arranged at the precinct level. Bilingual ballots cannot be found in every polling location. Quincy started to offer Chinese ballots in 2012 and Malden started to have ballots in both English and Chinese in 2017. However, what the act did solve is the transliteration of all candidates’ names, no matter whether it is a city, state or a presidential election. On the other hand, dependent on State Secretary’s decision for this midterm election, candidates’ transliterated Chinese names are not provided on bilingual ballots in Quincy and Malden. Kuang said Chinese names are only provided for city elections in Quincy and Malden, which is decided by the city government. Boston City Councilor at-large Michelle Wu also thinks the issue of transliteration should be addressed. After displaying the bilingual ballot and giving a brief introduction of each candidate’s position, Kuang started to introduce the three ballot questions and their background. Although the law prohibits non-profit organizations from endorsing or opposing a candidate running for public office, they are free to advocate for ballot measures to influence a proposed policy. There was an “Our Position” column on the right side of the screen, recommending all listeners to vote yes on all three questions. It poses another question: given their limited English proficiency, how shall we ensure that they have easy access to resources and civil education as non-partisan and fair as possible?